May 8, 2011 - Mooney Aircraft had stopped producing new aircraft due to the economy and had been focused on using their resources to maintain their certifications and supporting their existing fleet. This support has included the provision of service parts and the technical help desk. Money had sourced out their aircraft parts with local vendors in order to maximize parts availability to their customers and they continue to support Mooney owners, Mooney Ambassadors, Mooniacs, and their pilot associations MAPA and MOA. About two weeks ago Money?s website went down and as a result rumors began to surface that the company was having greater financial problems. Money?s website is back up and running and the company has issued a statement as to the reason for the website being down. ?As you may have noticed, our site was down over the last couple of weeks. First, and foremost this is not an indicator of our status as an organization. We have had a lot of rumors speculating that being down so long was a financial issue. Our hosting costs are inexpensive, so we would not let the site go down for such a simple oversight. So, in the spirit of transparency, we wanted to let you know what did happen and the steps we have taken to correct the issues. ?We contracted with our advertising agency to handle our marketing and the design of our website a few years ago. At the time, they did not have an interactive department and contracted with a 3rd party to handle the development component of the site. That development firm contracted with a company called Windstream to handle the hosting of our site. ?Over the last year or so we were getting sporadic letters from our customers and supporters overseas that the site was not accessible for them. We contacted our agency who had to check with the original developers who worked with the hosting company. Response times to such issues were slow and still remained unresolved. ?A couple of weeks ago, an alarm went off at the hosting company indicated that the server had been compromised. Someone had hacked into our site. They had been using it to host some of their own files and send out emails. As soon as the alarm sounded, the server was turned off. We had been off since. ?The quick solution would have been to retrieve the backup files and reinstall the system. The only issue was backing-dating the site to a point before the hacker first had access to the site. Plus, this wouldn?t take care of some of the larger issues we had been patching over the last year. ?So, we used this as an opportunity to simply switch to a hosting account that we would have direct access to. Our advertising agency now has an interactive department and we worked with them to transfer all of our files and data to the new server. We can now begin testing the site for access to other countries and taking other security precautions without the extra layers of red-tape and middlemen. Retrieving the old uncorrupted files, setting up the new server, and pointing the DNS is what accounted for the majority of the time it took to have the site back up and running. ?Now, Mooney Aviation Company is happy to announce that the site is live once again. We will continue to make changes and updates to the site without any significant delay in dealing with 3rd parties. We appreciate your continued support? 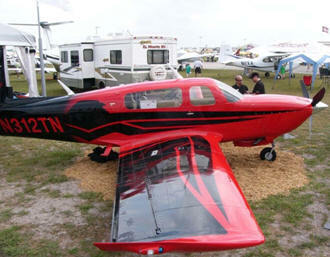 said Mooney Aircraft. Back in November of last year Mooney had another round of lay-offs that further reduced staff from 53 to less than ten employees by January 2011. The remaining employed staff is currently maintaining the company's physical facilities, its type and production certificates and providing parts technical support to aircraft owners. The company is negotiations with potential investors to allow production to resume. Company Chief Financial Officer Barry Hodkin stated, "We are not shutting down. However, we cannot continue to subsidize the company at the level we have in the recent past. We have been in discussions with potential investors for more than 18 months and will continue to work with them. If things change then the scope of this layoff could change"